Bronze Gears One of the first requirements when installing a steel roller camis the addition of a bronze distributor gear. A stock cast irongear is not compatible with a steel camshaft. 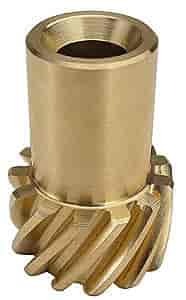 COMP Cams® gearsare machined from AMPCO-45 extruded aluminum bronze with 5%Nickel added. These gears feature a high-strength tooth designthat resists wear even when used with high pressure oil pumps.These extra tough gears are the answer when higher mechanicalproperties are demanded. Chevrolet-V8 262-400 396-454 90° V6 200-262 for ACCEL Distributor. Fits Shaft Diameter 0.500"